Spring is in the air! This is the time of year we are all itching to get outdoors. Is your patio space ready? If not, here are 5 Tips to Create the Best Outdoor Space on the block! Sliding patio doors are the perfect choice for homeowners looking to replace their current patio door on a budget. Further, these are accommodating for rooms with limited space or tight outdoor areas. Sliding French doors are now an option for the homeowner who wants the best of both worlds: a luxurious look with functional appeal. Add a sliding screen door, and this patio option will provide you fresh air without the pests! 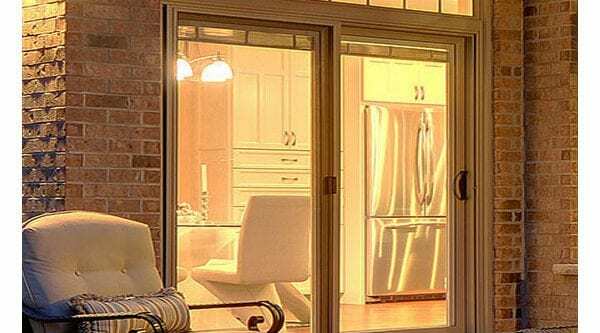 If you have the desire to the ambiance, light, and space in your home, inswing/outswing patio doors are for you! Though, you will want to assess the amount of space you have both inside and outside—these doors need a wide berth to function best for you. Note: inswing patio doors are the most popular. Why? When doors swing inward, this requires their hinges to be placed inside; not visible outdoors. No matter the size space you have outdoors, find a way to work with it! A small bench which doubles as a storage chest is a great option for added seating. A table is a must—even if it’s a small bistro table for two! Whatever you choose, look for complementing colours and styles. We have three fire pit style ideas for you that will transform your outdoor space into your favorite area at home! The Hole in the Ground Pit: AKA “in ground.” If you have the landscape for it, get out your shovel! A shallow hole with any stone, brick, or concrete block to frame it will do! The Above Ground Stone Pit: just like the in ground fire pit, with stone, brick, or concrete blocks configured around it. Gas Fire Pit: this one is a bit pricey, but stunning and modern. The fire burns through and atop decorative rocks with the entire structure built upon stone or wrought iron. Here in Brampton, ON, the first step to getting your patio space ready for Spring is to call the professionals here at Brock Doors and Windows! We would love to help you choose the best patio door in Brampton and/or added windows so your space can serve you this year! Give us a call or come visit our showroom—we can’t wait to meet you!